The British state in Ireland are out to dismantle all political opposition to their structures, and are using judicial maneuverings and complicit professionals to make it happen. 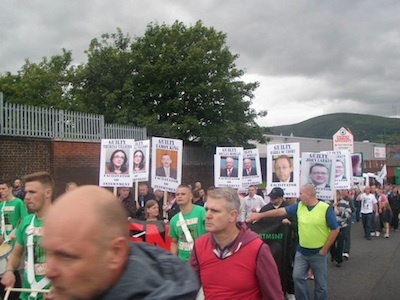 The most recent arrests and remanding of three valued activists can only be seen as a surgical removal from the streets of influential and experienced voices, capable of confidently articulating the shortcomings of the failed Stormont set up. This follows the same pattern as the engineered and well timed arrest of Marion Price, and exposes the desire of the state to pluck out the foundation stones of alternative politics here, using finely tuned judicial procedures and the complicity of corrupt professionals. One such individual is Barra McGrory, head of the Public Prosecution Service. McGrory inherited the privileged ability to attend law school, due to his fathers tireless work against cases of British injustice. He himself fronted his early career as being of the same spirit and vision of his late father. Yet today, instead of fighting against the state campaign of ‘internment by remand’, -- which for over a decade has seen judges systematically gaol Republican activists despite a clear lack of evidence -- McGrory has chosen to betray his father and the countless activists who he represented, by signing off on a judicial procedure which now allows military intelligence to offer up the most dubious ‘intercept evidence’ to magistrates who can be relied upon to remand/intern whoever appears in front of them, without question. McGrory knows he is being used by British intelligence. State ‘public relations’ required an individual from apparent nationalist stock to trigger the admissibility of ‘intercept evidence’ and Barra fitted the bill perfectly. He knows that in a court setting the most bizzare interpretation of a political activists conversation will still be accepted by trusted and compliant anti-republican judges of whom there are no shortage. It is our opinion that republican activists are to be mechanically remanded using this corrupt conveyor belt system, and that Barra McGory (and the raft of judges who are playing along) is facilitating the torturers and gaolers of MI5, by implementing Internment in the 21st century. Given the most recent wave of oppressive house raids, arrests and internment, he has well and truly turned his back on West Belfast. Given Britain’s clear intent to dismantle the republican alternative position, there is no longer any room for debate amongst the various political groupings as to the merits of a unified opposition to state repression. Britain is out to gaol our voices and destroy our principled position, their methods must be exposed and that has already been shown to only be possible on a unified basis. Tonight the British state and their corrupt allies are relying on Republican divisions as a means to lessen expressions of disgust at the actions of McGory, Larkin, Bagnal et al. We cannot allow them that luxury.